Continue reading "Project Update March 2019"
Continue reading "Whaling History Data"
This table from logbook entries includes information from logbooks from American offshore whaling voyages. These data were extracted from the original whaling logbooks during a scientific research project conducted by a team from the Census of Marine Life project (CoML, www.coml.org) led by Tim Denis Smith between 2000 and 2010. This map showing the spatial distribution of American Whaling and Whales in the 17th to 19th century was created using the AOWL data. Continue reading "Census of Marine Life logbook Data"
Continue reading "About Townsend’s Logbook Data"
The data presented here are from Charles Haskins Townsend’s extractions from whaling logbooks. They include information on the location of whales based on a sample of logbooks from voyages made between 1784 and 19?? The data represent roughly half of those originally used by Townsend to create whaling charts. Continue reading "About Maury’s Logbook Data"
The data here were extracted from whaling logbooks by Lt. Cdr. Matthew Fontaine Maury in the 19th century. The data include information on the location of whaling vessels and whales seen or caught from late 18th to mid-19th centuries. The American Offshore Whaling Logbook database, contains records transcribed from whaling log books giving information on the whales seen and captured, and the date and the location of the vessel. We plan to update the database annually. If you have corrections, additions or suggestions for improving the data, please complete this form, and we will communicate with you about them. 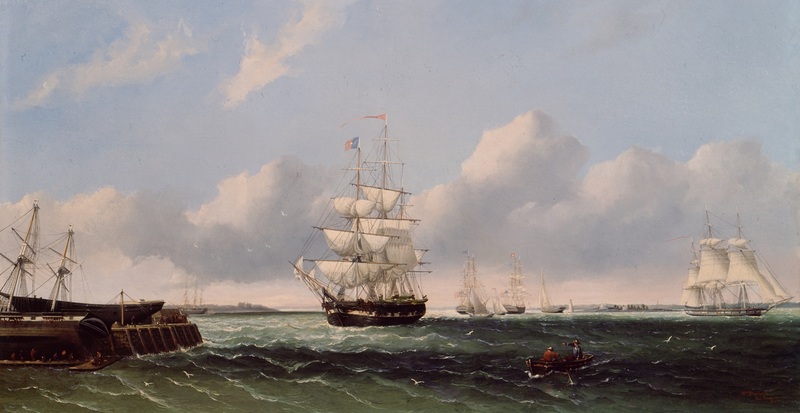 Continue reading "Corrections to Whaling Voyage Data"
Continue reading "About Consolidated Logbook Data"
Continue reading "Download Whaling History Data"
Your search returned too many American Voyages for vessels or places matching to display. Please narrow your search. [ Logbook for Harmony : 1790 ] 1790– IMA-NANT ATH ? Eldridge, Mary. Typed list attached to letter from Edwin Jacob to Mrs. Rattnoy, Feb. 27, 1965. Link → Cook, John Atkins. Pursuing the Whale. Boston: Houghton Mifflin Co., 1926. Account Book, Schooner D. C. Smith and owners with John Atwood, Jr. & Co., March 2, 1867 to November 25, 1868. Pilgrim Monument & Provincetown Museum, Provincetown, MA. Harding, Ephraim, Nathaniel Atkins, and Jesse Rich. Overseers, Town of Truro. Indenture. 29 September 1790. Kendall Collection, New Bedford Whaling Museum Research Library, New Bedford, MA. Townsend, James. Journal of a voyage on the Ship Atlas, 1825-1826. New Bedford Whaling Museum Research Library, New Bedford, MA. Mitchell, Edward and Randall R. Reeves. 'Catch History, Abundance, and Present Status of Northwest Atlantic Humpback Whales.' Reports of the International Whaling Commission (Special Issue 5) Historical Whaling Records. Cambridge: International Whaling Commission, 1983. Sanford, Frederick Coleman. Manuscript ledger Box 10, folder 7 and typed transcription of that ledger. Nantucket, MA: Nantucket Atheneum. Nickerson, Thomas G. Journal of a Whaling Voyage on Board Ship Wabash from New London Toward the South Atlantic Ocean, Luther Fuller, Master. Catalog, Raphael Osana Auction, Nantucket, MA. August 4, 2018. MacKinlay, Hillary. Atlantic Culture In The Pacific World: Maritime Whaling Voyages, 1827-1848. Master of Arts thesis, Dalhousie University, 2016. Joshua P. Atkins Thriver : 1862-1865 1862-Aug-20 Provincetown Boston USA 26 5' 6.000" Dark Brown Mate Discharged Fayal 9/22/1863.